Many, many centuries ago, there existed a society of beings. Their races multitude, the great Collective, as they've been come to be known as, ruled benevolently over the known cosmos for eons, dating back into prehistory. They succeeded where others failed, building a great solar empire that stretched across the span of dozens of galaxies. However, as time went on, they began to delve into secrets they were never meant to know, things that were better left not known. The Collective began to squabble among itself, tearing at itself and its brothers like dogs fighting over scraps of meat. These squabbles turned into all-out civil war, and the cosmos glowed with the energies generated by the battling factions. Eventually, all the races of the Collective died out in one way or another--whether by the complete genocide of their race or by the aftermath of the weapons used--save one, the Lenark. A long-lived species that was remarkably slow to populate, the Lenark's numbers began to dwindle as well, and they too knew it was only a matter of time before they went the way of the other species in the collective. Moving swiftly, the Lenark made it their mission to preserve the culture of the Collective as best they could, before dying out themselves. They built a great Compendium, filled with the knowledge of the Collective, and sent it on its way with the last Lorekeeper of the Collective, who died before the ship eventually crash-landed on a small backwater planet in the middle of an unexplored system......Your system. Centuries passed before the craft was finally found, and centuries more went by before one of the inhabitants of the village dared to venture inside and discovered the Compendium. With the knowledge of the ancients in hand, what will you do now? Dare you seek the stars? 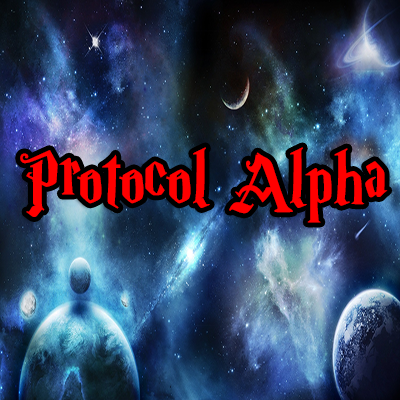 Protocol Alpha is a modpack developed by Nerd Storm Production LLC. Its focus is on that of Technology and space travel. Power generation is different from the standard Thermal Expansion methods. There is no Thermal Expansion. How will you convert between EU and RF? What systems will you build to support the ultimate goal.....Intergalactic Travel?